Flower walls are one of the most popular backdrops for wedding photo booth pictures. Instead of fresh flowers, opt for ones made of paper. You’ll have lots of options for colors and sizes, and won’t be limited to flowers that are in season. Best of all, you’ll save a pretty penny on the paper variety depending on the vendor. And if your budget doesn’t have room for a rental, you could always get creative with an easy DIY project! Since you and your guests won’t be able to get enough of this gorgeous backdrop, there’ll be plenty of photos snapped in front of it. To easily round up all the photos, check out these top 5 photo apps for your big day. Floral prints for wedding invitations are very popular. However, if you’re looking for something a bit more unique, use paper flower decorations on your invitations instead! They’ll add that touch of romance and elegance while staying intact on their way to your guests. With such pretty invitations, it’ll be hard for people to send their RSVPs back with a ‘no’! Lanterns have always been a lovely way to set the mood and make elegant decorations for weddings. They’re also blank canvases which can be easily personalized without breaking the bank. If you’d like to create your own, take a look at this DIY project by Adorable Home! While it may not be the most popular choice, it’s certainly one of the most unique! The upside to having a paper flower wedding bouquet? It’ll last you a lifetime! Whether it’s used during the ceremony or to frame doorways, a wedding arch made from paper flowers will definitely add a romantic touch to your wedding. It’ll also be perfect for those photo ops! If you’re looking for something different to make your wedding reception stand out, consider using paper flower decorations as the focal point for each table. You can even save space by opting for illuminated paper flower centerpieces! 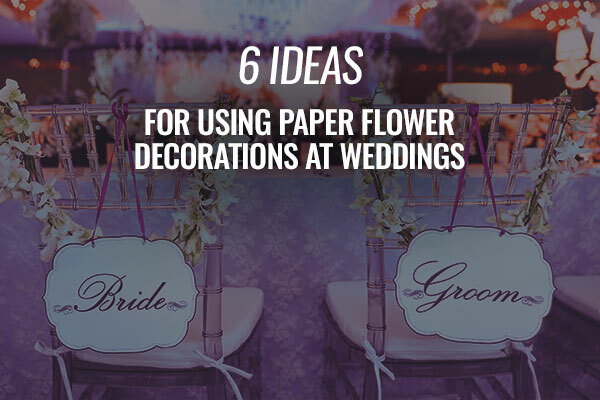 These are just a few of our favorite ideas, but there are many more ways you can incorporate paper flowers into your wedding décor. Have more ideas for decorations for weddings? Share them with us in the comments below!